The current political decisions do not only affect the economy, additionally also future capital stocks and (infra-) structures are significantly influenced. Generally one should keep in mind that natural resources as well as price inflation for produced goods highly depend on the decision whether to consume now or save them for later. One of the most important influence factors for the economical life is the government policy. The trade-off between the focus on present and future welfare (between consuming and saving) is mainly based on political decisions. Thus it is important to address the role of the government and understand how elections and voters might influence the decision of the political parties during their incumbency. This paper describes the motivation of the politicians to influence the voters before the election takes place in order to win. Generally speaking, they use economical instruments (like the Phillips curve, aggregated demand, budgets, etc.) to increase their chance for the next election. However the usage of these instruments produces a downturn shortly after the election; the whole process is called a political business cycle. In order to understand the problem field of political business cycles, one must look at the underlying macro-economical framework first; this could be described by different mechanisms like a budget constraint or due to the Phillips curve. Nevertheless this paper will use the Phillips curve as the underlying mechanism because it has been promoted in Nordhaus (1973) and also offers a very intuitive method to understand the mechanism. The curve itself includes the trade-off between unemployment and inflation in a society. Based on the underlying theory this section describes the basic background of the political business cycles. Furthermore it provides the necessary background information about the Phillips curve and its mechanisms. The most important assumptions are outlined and presented in order to act as a reference for the opportunistic and partisan models (Section 3 + 4). This paper describes both, the partisan and the rational opportunistic model in order to compare two important aspects: (a) the motivation of the parties and (b) the rational motivation of the voters. However the focus clearly lies on the rational opportunistic model. The rest of the paper structures as following: Section 2 gives an overview about the related work, with an emphasis on optimal inflation and empirical analysis. 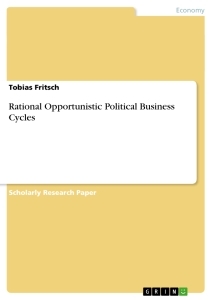 Afterwards Section 3 describes two different approaches for opportunistic business cycles models and pinpoints the main differences between them and the classical political business cycle model from Nordhaus (1973). Section 4 describes the partisan model; finally Section 5 outlines the main findings and includes a brief discussion about the different approaches as well as critics for each of them. In order to understand the opportunistic business cycles and the rational opportunistic model it is important to explain the two main terms “opportunistic” and “rational”. Opportunistic behavior describes the fact that each party (each of the two in the case of the models) is interested in winning the election. Even ideologically motivated politicians will act opportunistic (as long as they know the voters preferences). Rational behavior describes the voters’ motivation (in the rational opportunistic model). Contrary to the traditional opportunistic model, where voters do not “learn” from the politician’s behavior, the term of rationality indicates that each voter maximizes his or her individual preference function. An opportunistic business cycle is based on the asymmetry of available information between the government (parties) and the voters. Generally speaking, one can imagine the business cycle as a repeatable effect based on the motivation of the politicians to win the election. Therefore they use their influence on the economy in order to present a status quo (towards the voters), which is better than the natural growth. In other words the incumbent party tries to push the current growth to a higher level. A negative side effect is a phase of recession after the elections that is caused due to adaptive assumptions (towards inflation and growth). Therefore during the next period the economy will slowly stabilize until the next elections (where the incumbent party will try to push the growth again). This repeatable process is called a political business cycle. Based on the fundamental finding of Phillips (1958), it is generally agreed that there exists a trade-off between the level of employment and the rate of inflation in an economy. Both factors are competitive; this coherence is based on the intuitive argumentation that a low unemployment rate also means a relative high demand of workers (because of the reduced amount of potential unemployed workers). Therefore the industry is less flexible towards strikes, which in the end leads to a higher than usual increase of employees’ wages. However it is important to point out that the Phillips curve is just one possible method to model the underlying framework, a budget Generally speaking there is a stronger trade-off in the short run (mostly empirically underlined by analysing quarters of a year) compared to the long run. The Phillips curve (PC) describes the coherence between both factors and acts as a starting point for further analysis. Figure 1 visualises the PC for unemployment and inflation. As one can see, assuming the government has the opportunity to directly choose a point on the Phillips curve, there is still a major trade-off remaining between either a high inflation combined with a low unemployment or vice versa. With regards towards the empirical results one can see that this decision significantly influences the distribution of wealth in the society. As Alesina (1997) concludes: “an increase in unemployment reduces the income shares of the population ’ s two poorest quintiles and increases those of the two richest quintiles. Hibbs calculates that a one-year increase in the unemployment rate from 6 to 10 percent shifts about one percentage point of the income from the poorest two quintiles to the richest two”. Therefore different parties will choose their individual optimum along the curve. Generally speaking, the left party (which is more worker oriented) will try to set a low unemployment at the cost of a high inflation, meanwhile the right party (business orientated) will tolerate a higher level of unemployment in order to reduce the inflation. Concluding the main findings, one should also analyse a potential optimum for inflation and unemployment (party independent). This aspect will be discussed in Section 2.1. The models of (opportunistic) political business cycles have a wide variety of related aspects in macro-economy. This section outlines the most important aspects of the related scientific approaches. Therefore Section 2.1 discusses the idea of an optimal inflation and/or unemployment rate, which includes a deeper analysis of the Phillips curve. Afterwards Section 2.2 pinpoints important aspects of related empirical approaches. Finally Section 2.3 gives a brief overview about other (minor) related aspects of election theories. The related literature about opportunistic models includes a wide variance of different approaches that are based on Nordhaus (1973). Several authors like Cukierman and Meltzer (1986), Rogoff and Sibert (1988), Rogoff (1990) and Persson and Tabellini (1990) have slightly modified the traditional opportunistic model with consistent conclusions about the resulting business cycles. Each of their models includes the assumption of asymmetric information between government and voters. An important assumption of the business cycle model from Nordhaus (1973) is that voters prefer a low unemployment and a high stability in prices. Nevertheless it is important to analyse if the individual preferences of the voters match a possible optimum for inflation and unemployment. As the paper of Nordhaus (1973) shows, it is also possible to calculate the optimal inflation and unemployment of a purely benevolent politician. Empirical evidence for the business cycles as well as further results can be found in different scientific articles, such as Hibbs (1977), OECD (1970), Lindbeck (1976) and Kramer (1971). Several mayor findings will be summarized in this section in order to give an overview about empirical statistical analysis as well. One should keep in mind that due to the strong assumptions the resulting models do not accurately reflect the empirical observations. Hence it is important to address that the statistical white-noise (which is produced due to a wide variety of minor effects) has a significant influence. Nordhaus (1973) concludes the OECD (1970) statistical findings in order to show that with regular elections a fall in the unemployment rate before the election and a rise in inflation at the same time can be shown. Two main aspects are discussed in depth: (1) the politically determined policy choice will have a lower unemployment and a higher inflation is optimal and (2) on average the left party will choose a policy with comparably more inflation and lower unemployment. The findings were underlined by a empirical analysis of the 9 OECD countries (Australia, Canada, France, Germany, Japan, New Zealand, Sweden, UK and USA). Each of the countries was analyzed under the assumption that unemployment will fall before the election and inflation will rise shortly after the election (with a small delay), furthermore the rising unemployment rate after the election was also pinpointed. The statistical analysis further promoted the theory of business cycles, although one should note that the OECD countries fulfil an important set of pre-assumptions about the political stability and the influence of the government. Especially in development countries with political instability the effect of political business cycles could not be shown. Combined with the approach of Hibbs (1977), who analysis statement (2) (the difference in unemployment and inflation rate during a left and a right party’s office time), one can clearly pinpoint that the statistical evidences also promote differences during the incumbency of left and right parties. A further discussion about a possible equilibrium for both parties is featured in Section 4, within the partisan model. As Downs (1957) indicates, with complete information about the voters’ preferences even ideologically motivated politicians act opportunistic, because they are aware of the fact that they can only establish their ideologies as long as they are in charge. This finding is known as the convergence of the median voter theorem. Due to the motivation to maximize the chance for a victory at the next elections and therefore have a convergence of political programs, the scientific models for business cycles also include the basic assumptions of the median voter theorem. Another minor related aspect to improve the chance of winning an election is the design of the electoral districts. The task to re-form the shape of these districts is called Gerrymandering; by reshaping the districts the incumbent party creates disadvantages for the challenger in the next election by re-allocating potential voters in order to create intelligent electoral districts. Depending on the underlying political system and the depth of the statistical data this aspect also offers a wide variety of further “improvements” to win an election. Finally there exist several other (more recently used) techniques to improve the chance of winning an election. One of them is the technique of “broadening the base”, which describes the task to activate as many positive voters as possible (also based on statistical analysis of the deterministic factors). Alike Gerrymandering the technique can further improve the chances for a successful re-election. As a further approach, the rational opportunistic model from Persson and Tabellini (1990) modifies the assumptions of the traditional opportunistic model from Nordhaus (1976). This Section describes the main differences in between both models; where as Section 3.1 introduces the traditional opportunistic model from Nordhaus (1973); Section 3.2 features the rational opportunistic model, which is based on Nordhaus’ approach. The most important differences concerning the assumptions are also pinpointed. Finally Section 3.3 describes the existence of the equilibrium in the rational opportunistic model and explains the reasons. Based on the macro-economical framework Nordhaus (1973) created a political business cycle model with several assumptions. The main idea reflects the motivation of the government to win the elections in order to realize their policies. Such a behavior is called opportunistic, although one can show that even ideological orientated politicians will act opportunistic as long as they know the voters preferences. Without going to deep into the median voter theorem, Alesina (1997) quotes: “In this model (political business cycle model from Nordhaus), opportunistic policymakers can take advantage of an exploitable Phillips curve and face na ï ve voters to forget the past, ( … )”. As long as voters act myopic (they forget about the past and refer strongly to recent events), the government can stimulate the economy immediately before each election in order to signal that the economy is doing well (temporarily). After the election a short period of recession will be the price for such a policy. Figure 1 describes the long run Phillips curve, together with additional assumptions it is possible to show that in the short run the growth can exceed the natural limit and the economy can realize lower unemployment without (temporarily) no additional inflation. The following assumptions are based on the summary of Alesina (1997). Based on the assumptions the main mechanisms of the Nordhaus model can be pinpointed. Assumption 1: The economy is characterized by an expectation-augmented Phillips curve. rate of inflation. Furthermore y is the natural rate of growth and γ is a positive factor. Why did the United Party loose the 1948 General Election?